Glaucous-winged Gull glaucescens adult, December 05 2009, Portland, Oregon (Lyn Topinka). Purple orbital ring and extensive speckling in iris ( >75%). Glaucous-winged Gull glaucescens adult, February 16 2009, Portland, Oregon (Lyn Topinka). Purple orbital ring and extensive speckling in iris ( >75%). Glaucous-winged Gull glaucescens adult, January 22 2011, Ediz hook, WA ( Slater Museum). Purple orbital ring and extensive speckling in iris ( >75%). Glaucous-winged Gull glaucescens adult, February 17 2009, Beaverton, Oregon (Greg Gillson). Purple orbital ring and extensive speckling in iris ( >75%). 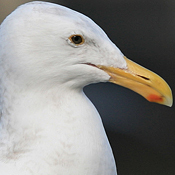 The occurrence of hybridism in gulls varies from rare to common, depending on the species. 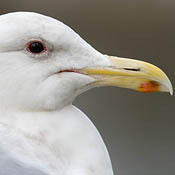 The most likely hybrid gull to be found breeding in British Columbia is Glaucous-winged Gull x Western Gull, although hybrid Glaucous-winged Gull x Herring Gull could occur. Hybrids can show the full range of characteristics of the parental types making field identification of individual birds difficult or impossible, except for those that are clearly intermediate. 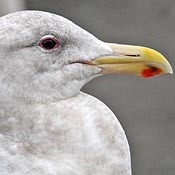 Glaucous-winged Gulls (Larus glaucescens) breed throughout coastal British Columbia and at a few inland sites, and Herring Gulls (Larus argentatus smithsonianus) breed on freshwater lakes throughout the interior of B.C. Pure Western Gulls (Larus occidentalis occidentalis) breed nearby on the coast of Washington but they have not been confirmed to breed on the coast of B.C. 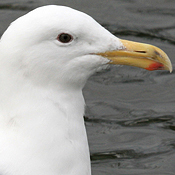 Glaucous-winged Gulls and Western Gulls hybridize freely on the coast of Washington and Oregon, where up to 75% of some colonies are hybrids. Hybrids are common on the south coast of B.C., which is a zone of introgression (backcrossing of a hybrid with a pure parent) rather than hybridization for these species. 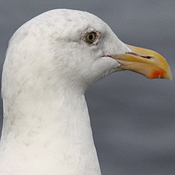 Glaucous-winged Gulls and Herring Gulls hybridize in southeastern Alaska where both species are common breeders, and hybrids are found in coastal B.C. in winter. 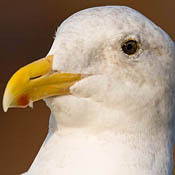 Herring Gulls have not been reported breeding in coastal B.C., but there is a single record of an interbreeding pair in the Okanagan. Although unlikely to occur, we should look for hybrids. Western Gull occidentalis adult, October 18 2009, Hammond, Oregon (Lyn Topinka). Limited speckled iris (10-15%), and not much winter streaking. Western Gull occidentalis adult, February 09 2012, Seaside Cove, Oregon (Lyn Topinka). Small red gonys spot on bill, limited speckling on iris, orange-yellow orbital ring, saturated orange-yellow bill. Clean white head. Western Gull occidentalis adult, February 14 2009, Portland, Oregon (Lyn Topinka). Small red gonys spot on yellow bill, yellow-orange orbital ring, extensive peppered iris (>75%), and not much winter streaking. 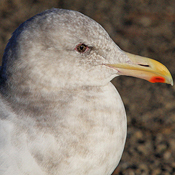 Western Gull occidentalis adult, November 15 2011, Beaverton, Oregon (Greg Gillson). Chrome yellow orbital ring and extensive speckling in dull olive iris ( >75%). HOW TO IDENTIFY HYBRID GULLS? The best way to identify hybrid gulls is by comparison with parental types using several characteristics, rather than a single one, to confirm that the bird in question is intermediate. A short description of the most useful characteristics to distinguish among adults in breeding plumage is presented below and in Table 1. A useful reference for identification of these gulls, which presents a variety of photographs as well as descriptions, is: Howell, S.G.N. and J. Dunn, 2007. A reference guide to gulls of the Americas. Houghton Mifflin Company, New York, New York. 516p. This large, grey-winged, pink-legged gull is distinctive; no other grey-winged gull occurs regularly in its range. It is heavily built and broad winged, with wingtips the same or barely darker colour than the mantle. The head is round with a stout, bulbous tipped bill (depth of bill generally deeper at gony-angle than at base). The general shape is similar to Western Gull but the head is rounder and the bill appears longer and less bulbous tipped. This large, dark-backed, pink-legged gull is distinctive; no other dark-backed gull occurs regularly in its range. It is heavily built and broad winged. The head is flat crowned with a domed forehead, a peak behind the eye and a sloping hind-crown. The bill is stout and bulbous tipped, often broader at the tip than at the base. Although hybrids show the full range of parental characteristics, the colour of the mantle and the tips of the primaries are good indicators of hybrids and identification is improved by examination of the colour of the bill, iris and orbital ring (Table 1). In B.C., most hybrids look like Glaucous-winged Gulls but the wingtips are a shade too dark. Others may look more like Western Gulls but their backs are a shade too pale and their wingtips are blackish (not black). In both cases the eye rings are mixed yellow and pink. They differ from Herring Gulls and many Glaucous-winged Gull x Herring Gull hybrids in colour of mantle, wingtips, bill and iris. They can appear similar to Glaucous-winged Gull x Herring Gull hybrids but structure (head and bill shape, long wings) separates them. This is a large, pale grey, pink-legged gull with moderately long wings with clean-cut, black wingtips and small mirrors. The square, blocky head peaks behind the eyes. The bill is fairly stout and parallel edged (gonydeal expansion distinct but not bulbous tipped). The pale mantle, jet black wingtips with small mirrors, pale eyes and parallel-edged bill makes it fairly distinctive in its breeding range in B.C. Hybrids span range of characteristics of the parental types (Table 1). Some look like Herring Gulls but their backs are a shade too dark, their wingtips blackish (rather than jet black) with more extensive mirrors, their eyes flecked dusky, and their eye rings mixed with pink. Others look like Glaucous-winged Gulls but have narrower wings and more slender bills, their wingtips a shade too dark and their eye rings mixed with yellow. 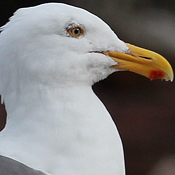 Head and bill shape are key factors in identifying many Glaucous-winged Gull x Herring Gull hybrids. They can look similar to Glaucous-winged Gull x Western Gull hybrids but the latter are heavier overall with shorter and broader wings, a darker mantle and less contrasting wingtips, and a rounder head with a heavier, bulbous-tipped bill. Western Gull occidentalis 3rd cycle (4CY), January 15 2017, San Leandro, California, USA. Picture: John Cant. Western Gull occidentalis sub-adult, January 13 2017, Pillar Point Harbor, San Mateo Cty., California, USA. Picture: John Cant. Western Gull occidentalis 3rd cycle (4CY), January 1990, California, USA. Picture: Alex Abela.